We reported the first case of inoperative thymic adenocarcinoma successfully palliative treated by the double-stent procedure. 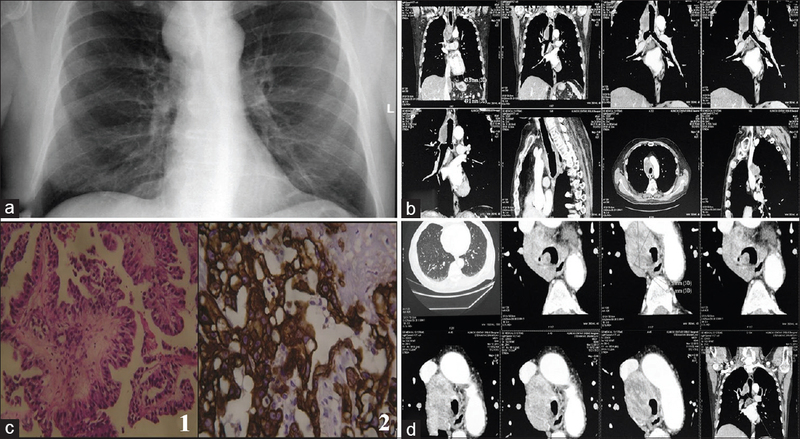 In a patient who expressed stridor, computed tomography was done and necrotic mediastinal mass, which protrudes into a trachea, was demonstrated. Fiberoptic bronchoscopy showed tracheal infiltration and 70% stenosis; therefore, surgical resection was inapplicable. Recanalization with repeated argon plasma coagulation and debridement of necrotic mass was performed, followed by placement of the endotracheal stent, radiotherapy, and chemotherapy. After 1 year, the patient developed gastric aspiration and tracheoesophageal fistula; therefore, the esophageal stent was placed. The outcome was lethal, but the placement of endotracheal stent significantly increased a length of survival for the patient with invasive thymic adenocarcinoma. Primary thymic adenocarcinoma is extraordinarily rare with high malignant potential and poor prognosis. The multimodal approach in the treatment of thymic carcinomas includes surgery, radiotherapy, and chemotherapy. We report the case of inoperative thymic adenocarcinoma palliative successfully treated by the double stent. A 53-year-old male developed a cough and stridor, 1 month after cholecystectomy. Spirometry results were within referent range, postintubation stenosis was suspected, and chest X-ray was done. Incidental 6.5 cm mediastinal mass was revealed [Figure 1]a. Computed tomography (CT) revealed enlarged subcarinal lymph nodes and necrotic mass (6.5 cm) protrudes into distal trachea and compression of vena cava inferior (VCI) [Figure 1]b. Fiberoptic bronchoscopy showed 2 cm infiltration of the trachea with two-third stenosis. Needle biopsy showed branching papillae with fibrovascular cores composed of cells with nuclear atypia. Immunohistochemistry of necrotic tissue showed positivity for EA, CK-5/6/7/19, CD-5/117, CD-5, galectin-3, and carcinoembryonic antigen, what confirmed the diagnosis of thymic papillary adenocarcinoma [Figure 1]c. Other primary origin sites were excluded from the study. The tumor was inoperative due to the severity of symptoms and comprehensive tracheal stenosis. Recanalization with plasma coagulation, debridement of necrotic masses, and the placement of Polyflex endotracheal stent (Boston Scientific Co, Boston, Massachusetts, USA) [Figure 1]d was performed, followed by radiotherapy and chemotherapy (carboplatin 5 mg/ml and paclitaxel 225 mg/m 2). General patient's condition was better, but 1 year later he developed a productive cough with foul-smelling sputum. Evaluation of sputum sample revealed gastric content, while radioscopy with barium passage and thoracic CT revealed tracheoesophageal fistula. Therefore, 12 cm tracheoesophageal stent was placed to cover fistula [Figure 2]. One month later, right-side pneumothorax developed. 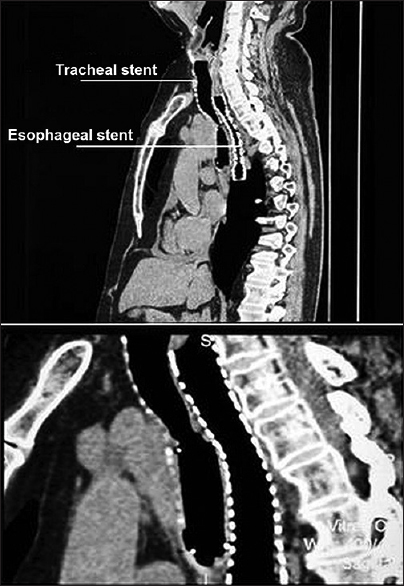 Esophagogastroduodenoscopy and bronchoscopy revealed broncho-esophageal-pleural communication, with esophageal stent protruded into the trachea and right bronchus and with tracheal stent protrudes into the esophagus. Although thoracic drainage was performed, the patient died 4 days later. This is the first case present thymic adenocarcinoma successfully treated with surgery and stent placement, afterward complicated with tracheoesophageal fistula. Thymic adenocarcinoma is extraordinarily rare neoplasm with only a few case reports in the literature.,, Standard therapy regimens for thymic carcinomas include surgery, radiotherapy, and chemotherapy. There are only two reports in the literature based on radiotherapy alone with poor outcomes., In the presented case, surgery was not considered due to the extraluminal and intraluminal invasive tracheal propagation, VCI compression, and enlarged lymph nodes. Up to the best of our knowledge, this is the first case of stent placement in the patient with thymic adenocarcinoma aimed to improve patient's respiration, followed by radiotherapy and chemotherapy. Airway and/or esophageal stent insertion provides an effective approach to improve the quality of life in patients with malignant disease. Although rare, the double-stent procedure was reported in the case of esophageal carcinoma with tracheoesophageal fistula as the complication of chemotherapy and radiotherapy. In our patient, dyspnea reduced after esophageal stent placement. Tracheobronchial and esophageal stent insertion are recommended for patients with thoracic malignancies with tracheoesophageal fistula with almost none reported complications of perforation. In patients with malignant tracheobronchial communication treated with supportive care alone, lethal outcome occurs rapidly with the mean survival time of 1–6 weeks. Stent placement should be considered as palliative care in patients with thymic carcinoma as it could extend survival. Dr Aleksandra Barac received non financial support for her research from the Project of Ministry of Education, Science and Technology of the Republic of Serbia (No. III45005). Maghbool M, Ramzi M, Nagel I, Bejarano P, Siebert R, Saeedzadeh A, et al. Primary adenocarcinoma of the thymus: An immunohistochemical and molecular study with review of the literature. BMC Clin Pathol 2013;13:17. Furtado A, Nogueira R, Ferreira D, Tente D, Eisele R, Parente B. Papillary adenocarcinoma of the thymus: Case report and review of the literature. Int J Surg Pathol 2007;31:1330-6. Ra YJ, Bae MJ, Kim YS, Choi KU. Difficulties in diagnosis and treatment of thymic adenocarcinoma producing beta-human chorionic gonadotropin in anterior mediastinum. Interact Cardiovasc Thorac Surg 2010;11:114-6. Choi WW, Lui YH, Lau WH, Crowley P, Khan A, Chan JK, et al. Adenocarcinoma of the thymus: Report of two cases, including a previously undescribed mucinous subtype. Am J Surg Pathol 2003;27:124-30. Takahashi F, Tsuta K, Matsuno Y, Takahashi K, Toba M, Sato K, et al. Adenocarcinoma of the thymus: Mucinous subtype. Hum Pathol 2005;36:219-23. Ishiwata T, Sekiya M, Suzuki T, Matsuoka T, Kumasaka T, Takahashi K, et al. Thymic adenocarcinoma with sarcomatoid features characterized by intracaval tumor growth: Report of a case. Surg Today 2010;40:1068-72. Detterbeck FC. The international thymic malignancy interest group. J Natl Compr Canc Netw 2013;11:589-93. Herth FJ, Peter S, Baty F, Eberhardt R, Leuppi JD, Chhajed PN, et al. Combined airway and oesophageal stenting in malignant airway-oesophageal fistulas: A prospective study. Eur Respir J 2010;36:1370-4. Kvale PA, Simoff M, Prakash UB, American College of Chest Physicians. Lung cancer. Palliative care. Chest 2003;123:284S-311S.